I wanted to make a very dear friend of mine a birthday card. We are both animal lovers and I thought this would be perfect for her! Hope you all are having a wonderful day!!! Congrats sweetlilscrapper! Please send me your mailing address as soon as possible. I will also contact you by email. Thank you for participating!!! Shhhhhh...Don't tell anyone...this is a Cricutless project!!! Well I am on spring break this week and I have to say....I haven't accomplished very much but it has been a relaxing week ;) I love spring and I love butterflies so I thought I would create a few cards. Believe it or not I did not use any of my CRICUT machines!! *gasp* ;0 I can't believe it! Stay tuned tomorrow for the Keep the Peace blog hop!! My Pink Stamper stamp set (for the inside of the card I stamped "Celebrate your day"
Here's a quick and simple scrapbook layout! The Paper Dolls for Everyday cartridge was used to create the baseball diamond, Graphically Speaking was used for the "Play Hard" logo, Mickey Font was used on the Gypsy and I welded the letters to create the "Blue Crab Stadium" title. The Baseball cartridge was used for the baseball cap. Some of you must be wondering why I have used so many cartridges for this 2-page layout....well it is very easy to utilize many of your cartridges with the Gypsy. It saves me a lot of time. I have been trying to concentrate on my own family scrapbook albums and I have a lot of catching up to do! These pictures were taken two summers ago-and I remember it being a very hot and sticky baseball evening. Just check out my hairdo!! LOL I hope you are enjoying this beautiful Sunday. Today, on the 4th Annual World Autism Awareness Day, we are joining prominent buildings across North America and the world — including the Empire State Building in New York City and the CN Tower in Toronto, Canada — who will turn their lights blue to raise awareness for autism and to commemorate World Autism Awareness Day. 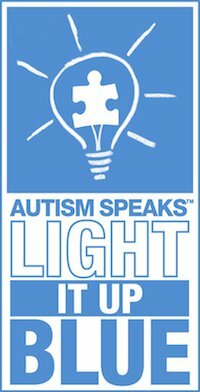 Light it up Blue is aiming to light the world blue all throughout April — city by city, town by town — by taking action to raise autism awareness in our communities. •Raise awareness for Autism online or spread the word about Light It Up Blue. The fourth annual World Autism Awareness Day is on April 2. People, schools, organizations, and companies are hosting events around the world. My youngest son, Ryan was diagnosed with high functioning autism eight years ago. He is now eleven years old and makes my life a wonderful adventure. Our family has experienced many things with Ryan-sometimes it feels like a roller coaster ride and other times we feel like we are on a cruise!! Autism is not scary. It’s heart-wrenching to learn about it and grow with it, but seeing the positives in my son is what keeps me going. I don’t want people to shrug away from me when they hear that “A” word – I want people to ask questions, to get to know the autism we live-It is different for every single person. Everyone has their own challenges, I never want to discount that about anyone or claim that my life is harder. I also don’t want people to assume life is easy living with a person who has autism. We still have challenges that wear me out and hurt my heart but I wouldn't want my life any other way! Most importantly, I’d like to emphasize the importance of celebrating everything – even the small stuff. For some people the small stuff IS the big stuff. Lastly, reach out for support. Get involved in a charity related to your need. Talk with other moms with special-needs children. Speak up when something doesn’t feel right. Share stories, celebrate every single day, eat some chocolate, and most of all craft!